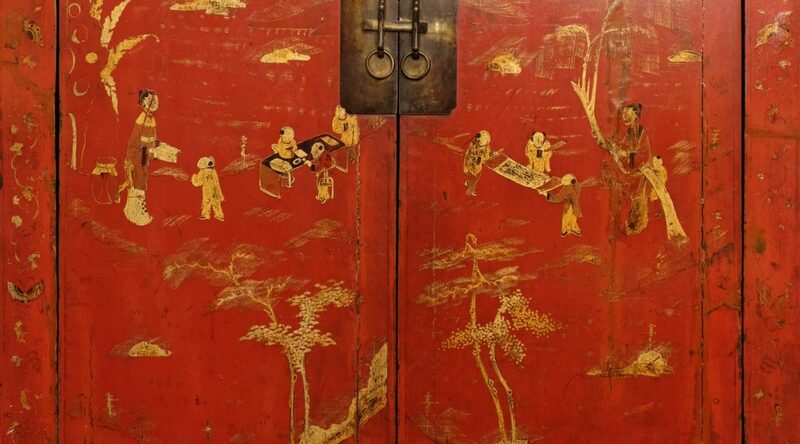 #16040 is a red lacquered wedding cabinet with gilt decorations showing children at their lessons. 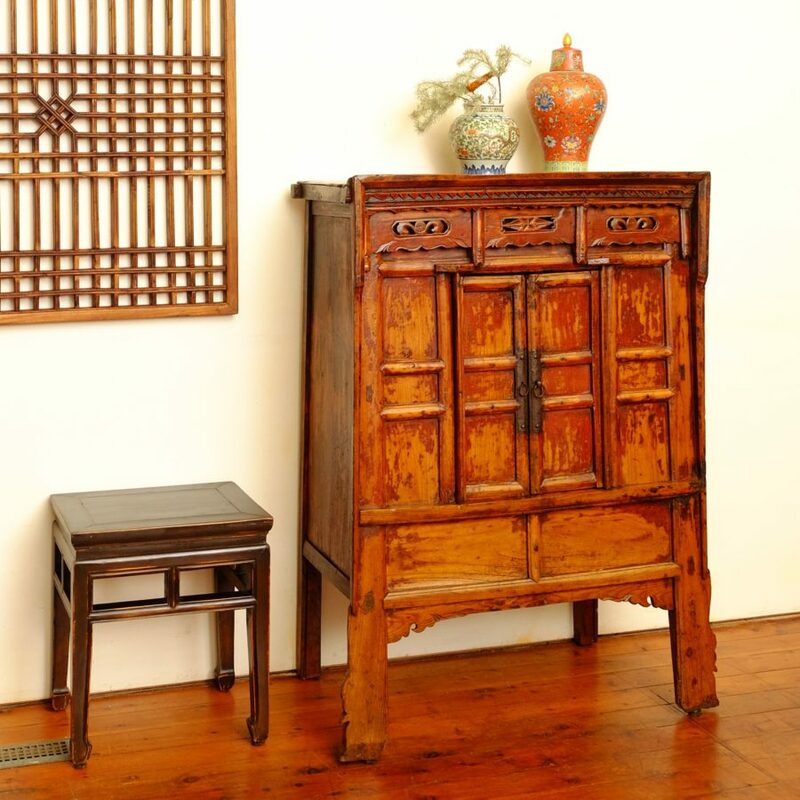 It comes from Shanxi province, dates from the mid-1800s and is made of northern elm. 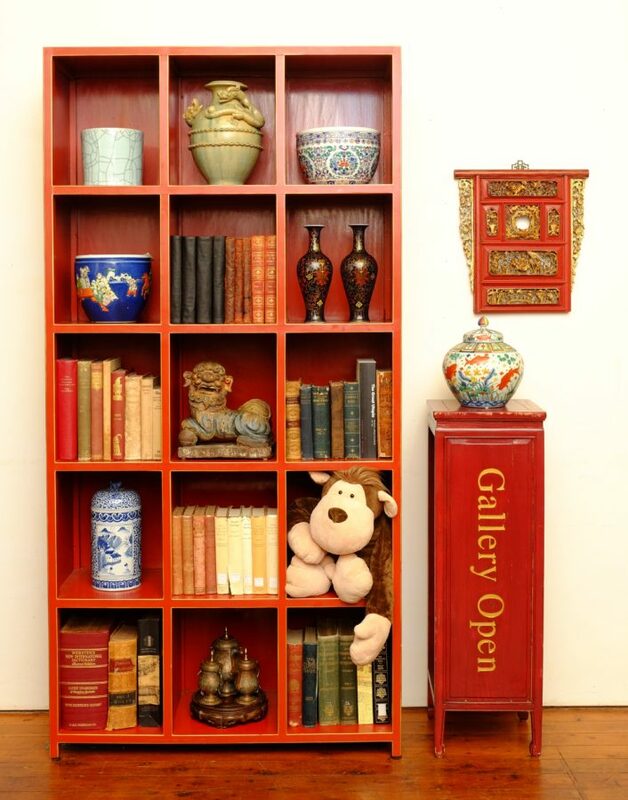 It is 120 cm wide, 56 cm deep and 188 cm high with two shelves and generous storage in the base. 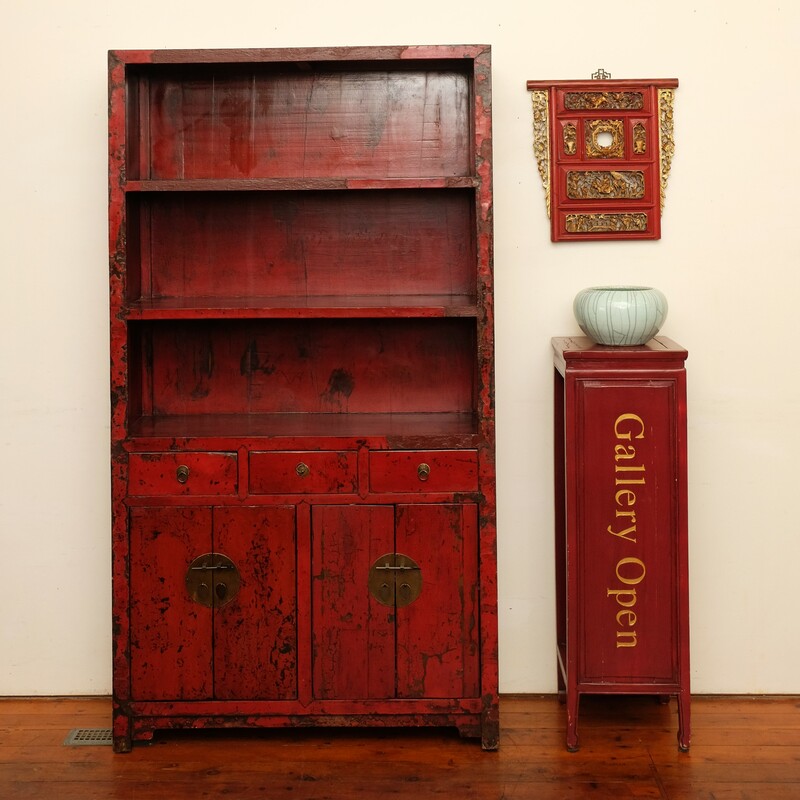 #120003 is a red lacquered book shelf/cabinet made from northern elm in the late 1800s in Shanxi province. It is 108 cm wide, 36 cm deep and 197 cm high. It has two shelves above a three-drawer four-door cabinet. 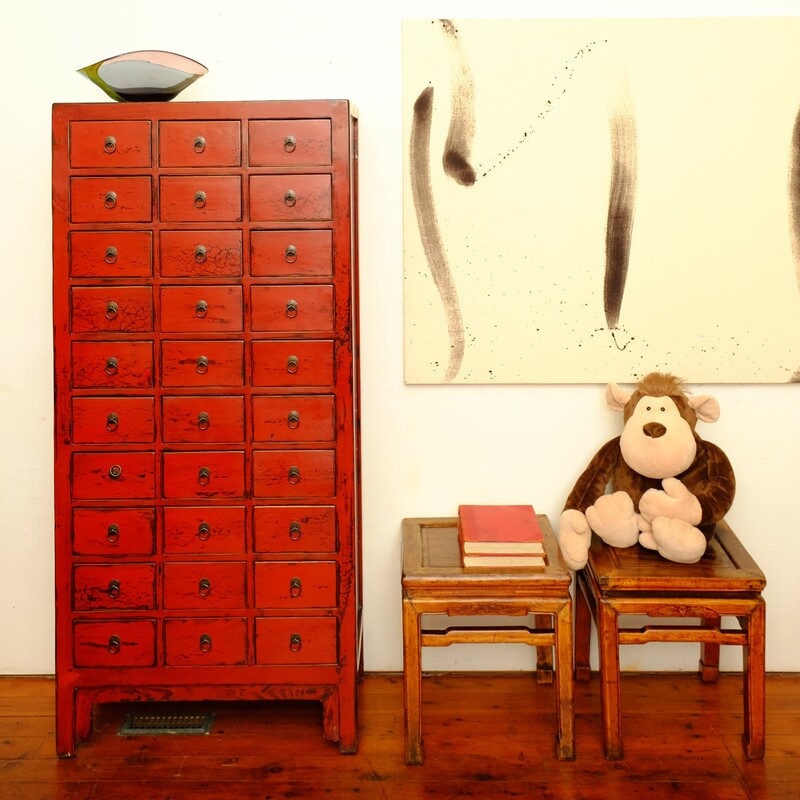 #112007 This tall Ming style cabinet from Shanxi province is fitted with four shelves and two interior drawers. It is made from willow wood and dates from the late 1800s. It is 101 cm wide, 60 cm deep and 193 cm high. 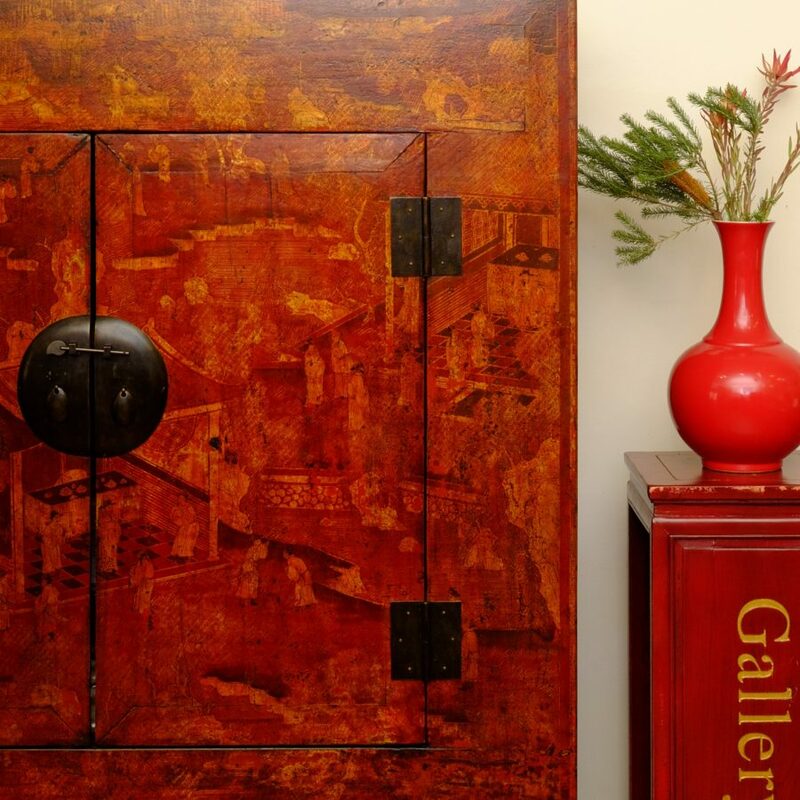 $101010 This large cabinet with exquisite paintings in gold on red lacquer is a rare find from the early 1800s. 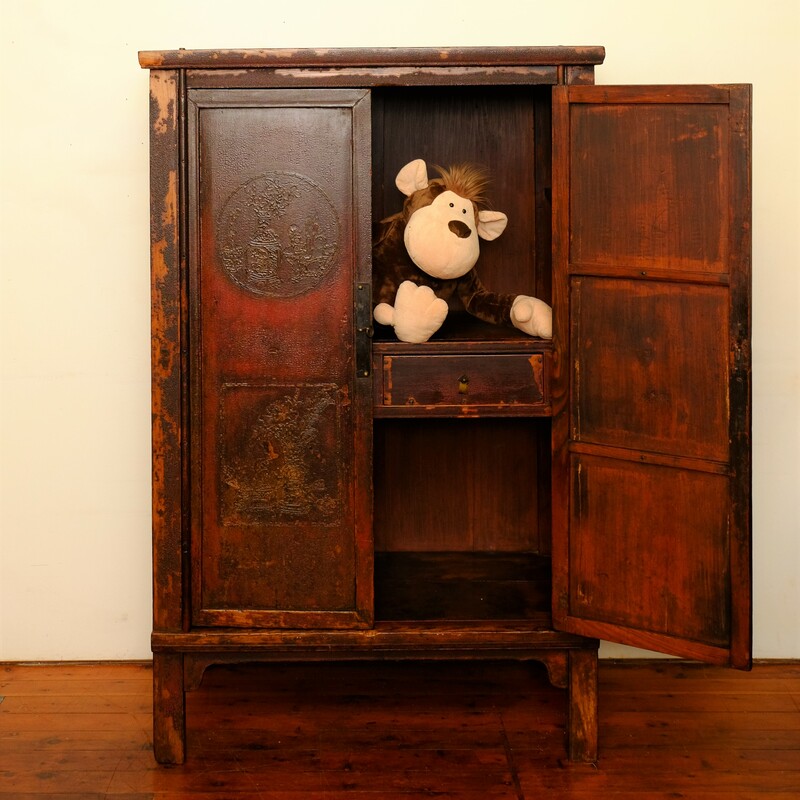 It has an original secret compartment for storage plus extra shelving for practicality. 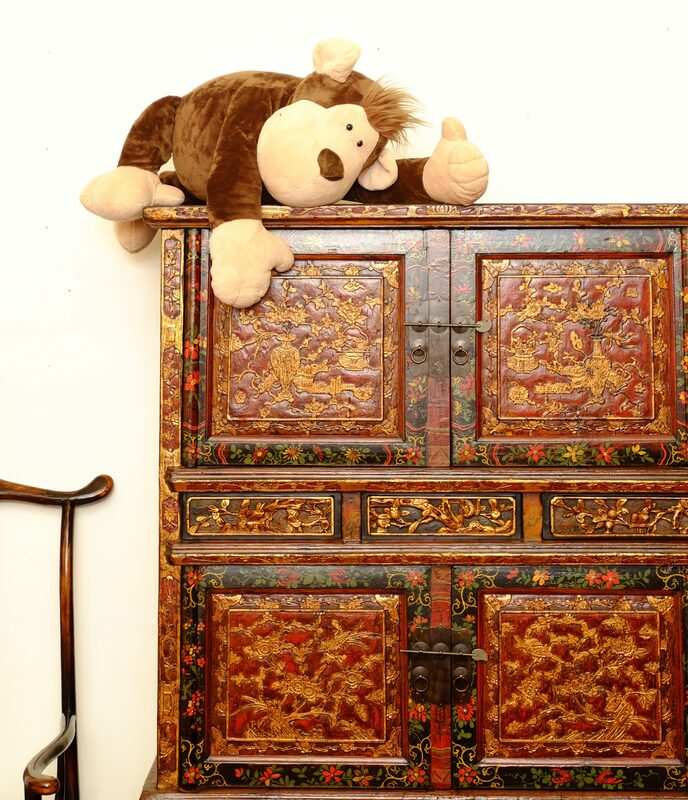 From Shanxi province, it is made of northern elm and measures 150 cm wide, 57 cm deep and 191 cm high. 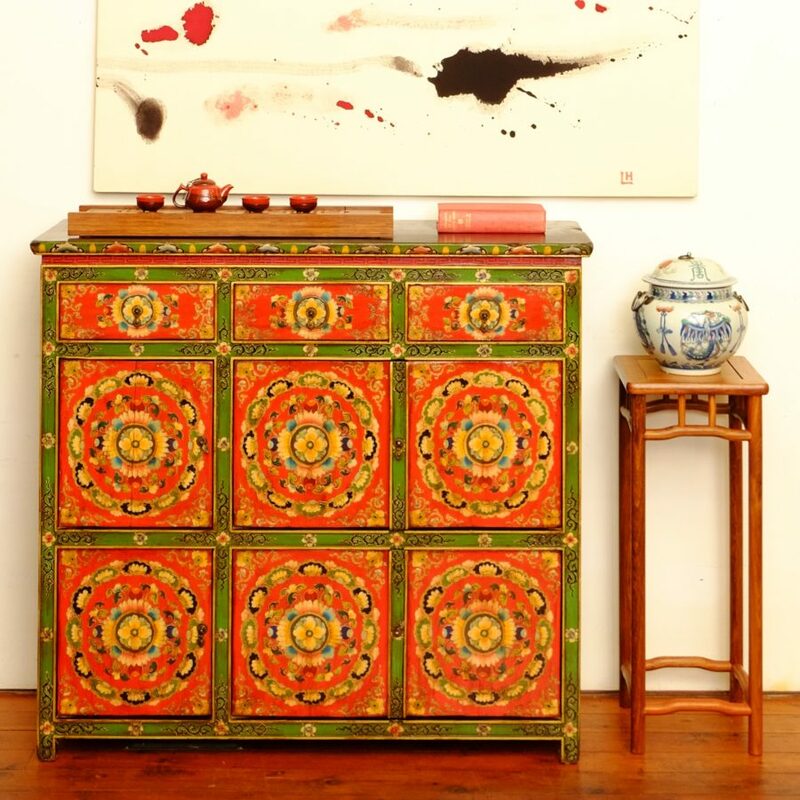 #101010 A closer view of the glorious painted scenes that cover this signature piece of furniture. You see something new almost every time you look! #810073 is perhaps the oldest piece of furniture in the Gallery. From Shanxi, it dates from the the late Ming period in the early 1600s. It is in original condition with faint traces of brighter colour discernible on the door roundels. Made from northern elm, it measures 114 cm wide, 60 cm deep and 181 cm high. #180073 a glimpse of the interior showing one of two drawers on the central shelf. 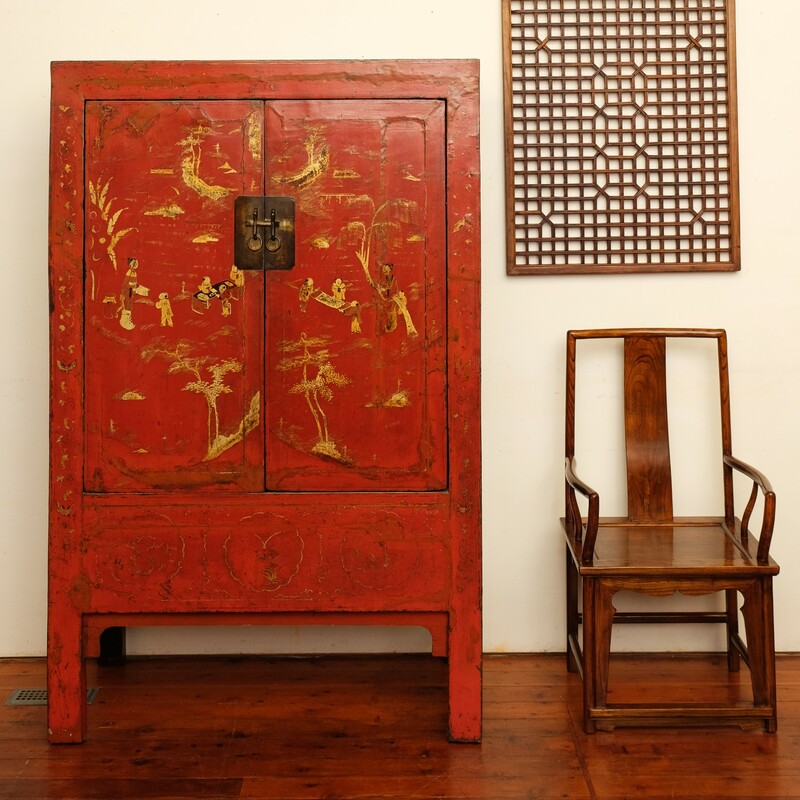 #82019 This striking cabinet decorated with intricate carving and fine gilt painting over a red lacquered surface is a feast for the eyes. 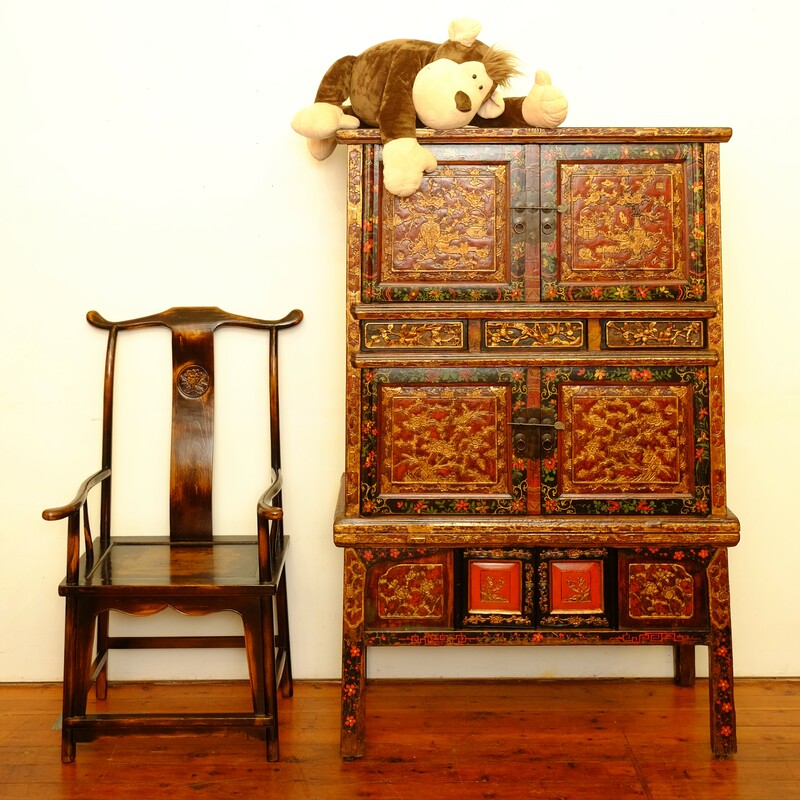 From Fujian province, it is made from fir wood and dates from the mid 1800s. The two compartments above and below each have a useful shelf and are separated by three small drawers. An additional small compartment at the bottom is accessed by the two small red doors. #820019 A close-up view of the exquisite decoration. #16041 is an interesting cabinet in black lacquer decorated with gold butterflies. A two-door compartment at the top and a larger two-door compartment with a shelf below provide generous storage. 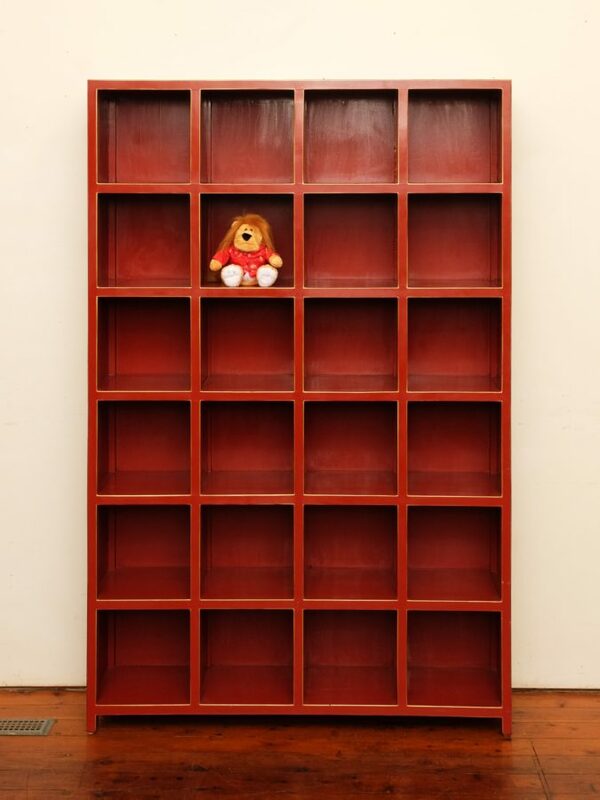 The cabinet measures 82 cm wide, 49 cm deep and 156 cm high. 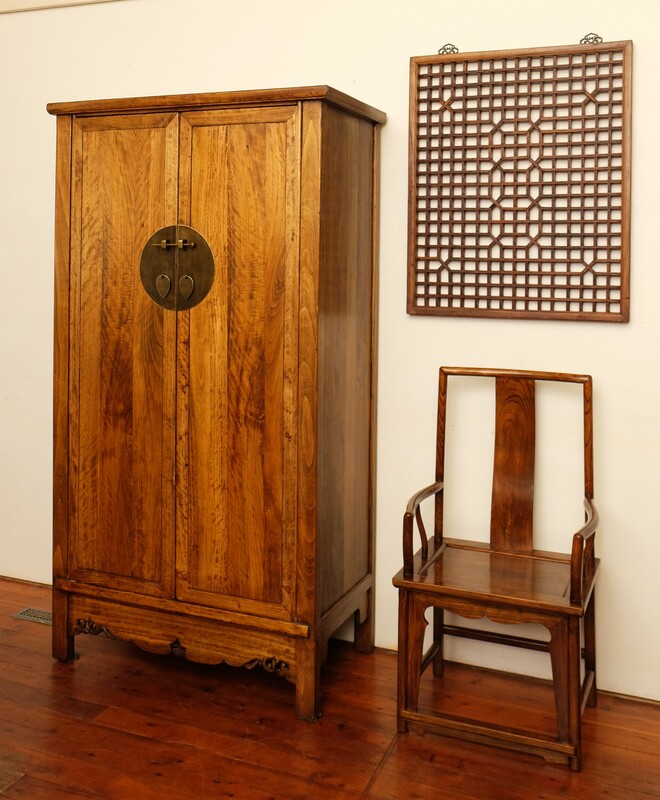 #13137 This elegant early 1900s medicine cabinet from Shanxi province would be perfect for the hobbyist or for storing small items in a dressing room. It is made of northern elm and is 91 cm wide, 47 cm deep and 128 cm high. #13137 A closer view of the drawers. The unit contains ten rows of three drawers, making thirty in total. 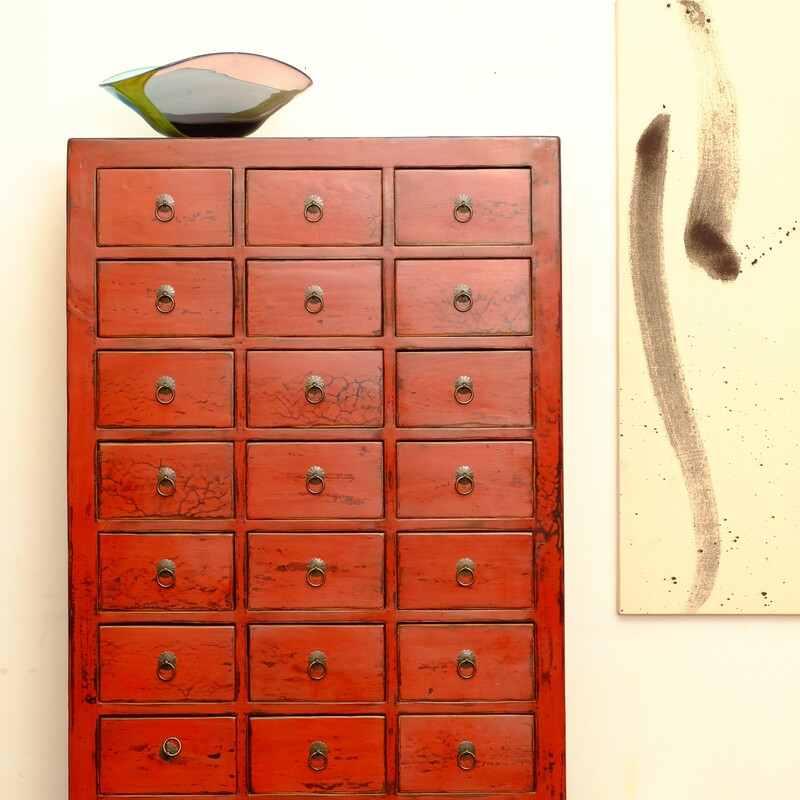 Each drawer has two compartments, making sixty in all. The front compartment measures 19 x 17 cm and the other 19 x 16 cm (inside measurements). Both are 9.5 cm high. #810064 This charmingly rustic kitchen cupboard is the only piece of furniture in the Gallery where nails were used in its construction. The eight slats across the centre of the doors and front panels are held firmly in place by eight handmade iron nails. 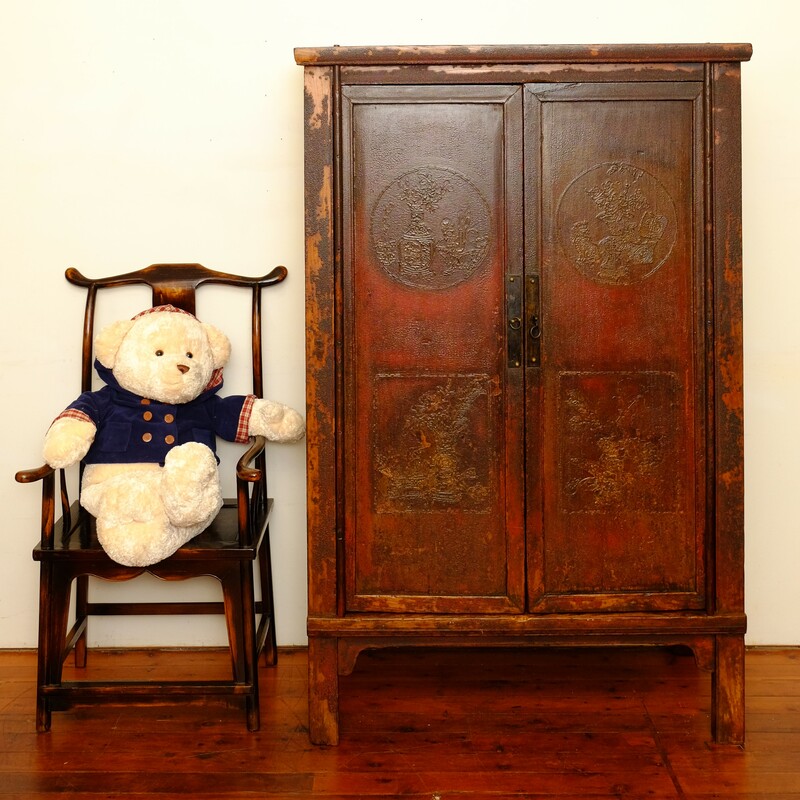 The cupboard is made from poplar and elm and dates from the mid 1800s. It measures 80 cm wide, 42 cm deep and 173 cm high. 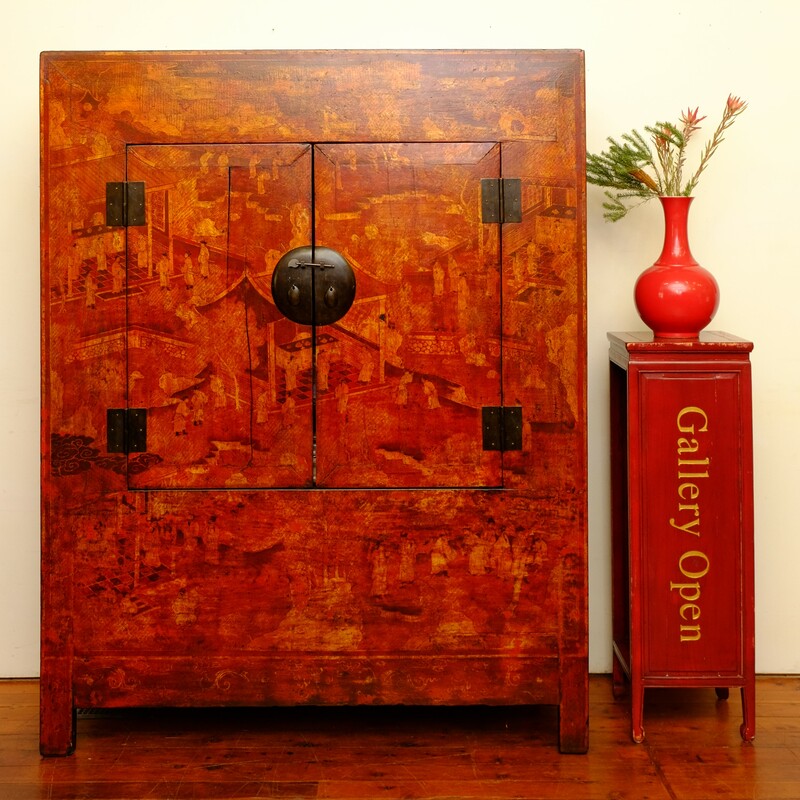 #15010 Here is a another cabinet to brighten up your room and your life! 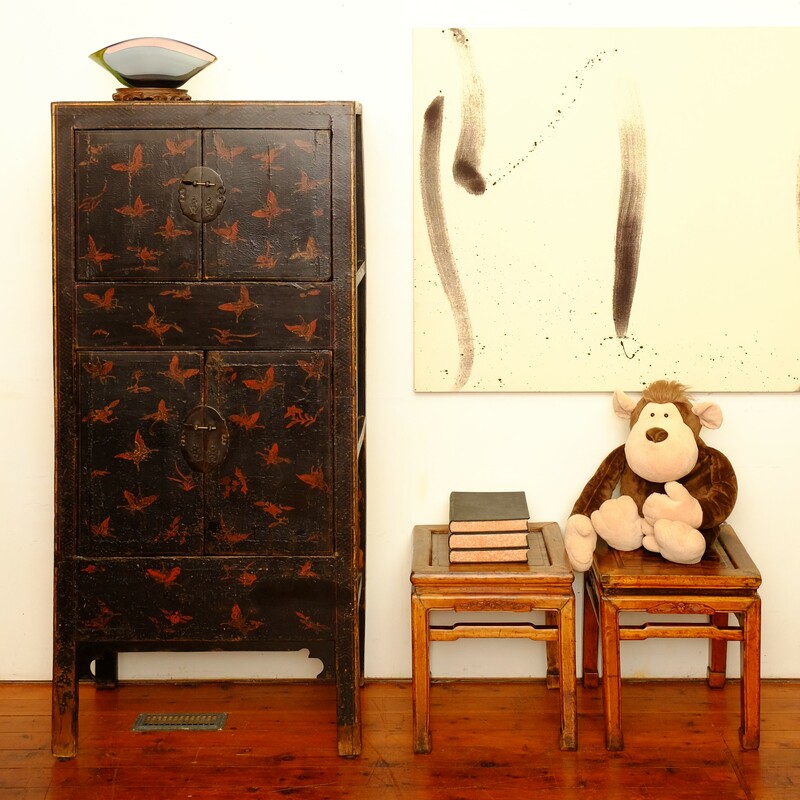 This large Tibetan painted three-drawer six-door cupboard was made of willow in the mid 1900s in the Tibetan region. It is 120 cm wide, 40 cm deep and 111 cm high. Each of the six compartments will accommodate items up to 35 cm high and 31 cm deep. #910061 This shelving unit in elm can be custom made to any dimensions. This unit is 110 cm wide, 40 cm deep and 222 cm high. The individual compartments in the unit are 35 cm wide and 40 cm high. #910061 another view in order to let the Monkey have his day in the limelight! #910061 in different dimensions. 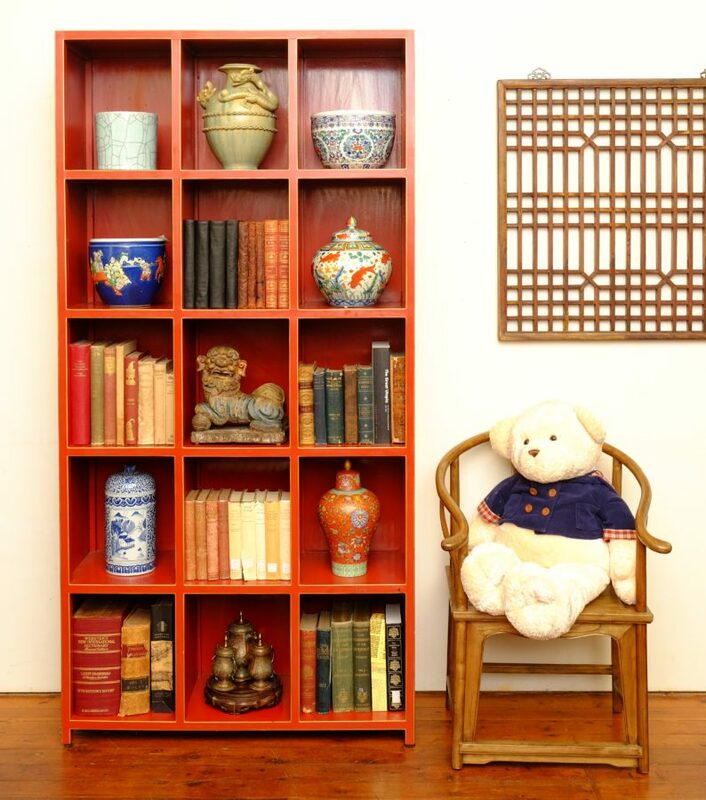 This time it is 123 cm wide, 31 cm deep and 190 cm high – ideal for displaying Hou’s tea wares.